Group Members (from left): Thomas Reisinger, Arne Fischer (Alumnus), Horst Hahn, Robert Kruk. Not in picture: Herbert Gleiter, Cahit Benel, Reda Chellali, Soumabha Bag, Ananya Baksi, Nicolas Gack. For the synthesis of such cluster-based materials a beam line was recently designed and constructed. The system is capable of producing a large range of cluster sizes from single up to several thousand atoms and provides a cluster beam with a narrow mass distribution of about 2 to 10%. It offers the ability to optionally co-deposit mass-selected clusters together with matrix materials and thus can be used to prepare a wide range of cluster-based materials. In the cluster source inert-gas aggregation in combination with magnetron sputtering is utilized. Since the emerging clusters are to a great extent ionized, they can be picked up by electrostatic lenses and formed into an ion beam. 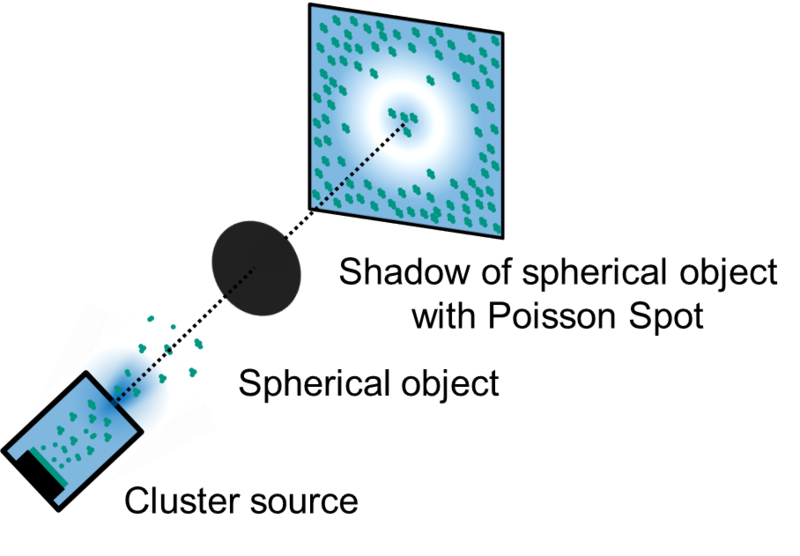 In a first stage behind the source the clusters can be directly deposited, resulting in pure cluster films with thicknesses of several 100 nm. In this setup information about the deposited masses can be derived from a TOF mass spectrometer. 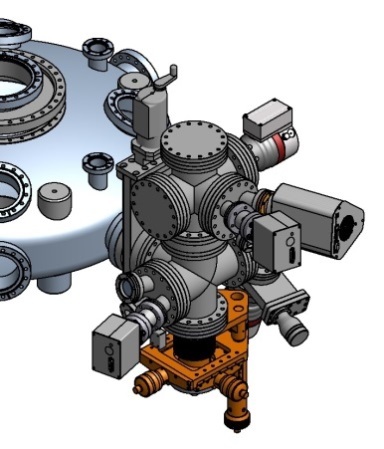 Alternatively, a second stage located behind a 90° sector magnet allows for deposition of precisely mass-selected clusters with controlled impact energies and additional matrix materials from up to two evaporators. Here, cluster films with thicknesses of around 10 nm are feasible. In combination with our Inert-gas condensation (IGC) systems (see Nanoglass Topic), where milligrams of clusters can be produced (without mass selection) we can cover the whole range of cluster-based materials from nm thick, well defined thin films up to bulk cluster materials. As a surplus, the system is part of a large integrated UHV lab with in-situ access to various synthesis and analysis methods, such as molecular-beam epitaxy (MBE), DC/RF-sputter deposition, pulsed-laser deposition (PLD), X-ray photo-electron spectroscopy (XPS), scanning-probe microscopy (AFM, STM) and low-energy electron-diffraction (LEED). Recently, an operando characterization chamber for catalysis has been designed and being built as an additional facility to the integrated UHV lab to study any catalytic reaction taking place on small clusters, provided that the concentrations of the reactants and products can be measured with mass spectrometry. This will allow us to determine the catalytic activity of the model catalyst systems realized by the CIBD setup without exposing samples to air. A. Fischer, R. Kruk, and H. Hahn. A versatile apparatus for the fine-tuned synthesis of cluster-based materials Rev. Sci. Instrum., vol. 86, no. 2 (2015). A. Fischer, R. Kruk, D. Wang, and H. Hahn Magnetic properties of iron cluster/chromium matrix nanocomposites Beilstein J. Nanotechnol., vol. 6, no. 1, pp. 1158–1163, (2015). In addition to these material-science-based activities mentioned above, we work on a problem that is motivated by a question taken from the foundations of quantum-mechanics. Namely we are interested in the particle-wave duality of clusters and the question if the particle-wave duality continuous to apply to particles of increasing size, mass or complexity. Is it possible to prepare clusters in a super-position of two macroscopically distinct center-of-mass states and thus make it possible to realize paradoxical states such as Schrödinger’s cat being both dead and alive? To avoid this type of paradox theorists have put forward modifications to quantum-mechanics (q-m) by postulating various mechanisms that cause decoherence apart from the environment. Deviations from standard quantum-mechanics are predicted for particle masses as low as one million atomic mass units (amu). The current record particle mass for which the particle-wave duality has been demonstrated is about 10000 amu. We are currently developing a cluster-based interferometer based on Poisson’s spot that aims to close this gap and thus test if quantum-mechanics really does apply at increasingly macroscopic scales.